The Walking Dead finally breaks out of its claustrophobic prison setting and sees the characters hit the road in an episode that is just as packed with zombie horror as it is with deep character drama. The action picks up where we left off last week with Daryl, Michonne, Tyreese, and Bob Stookey still searching for medical supplies to combat the illness in the prison as Rick and Carol go off to search on their own. Like last week, this episode is light on gore and heavy on character development, but what “Indifference” will be remembered for is one very shocking plot development that completely changes the tenor of the season. 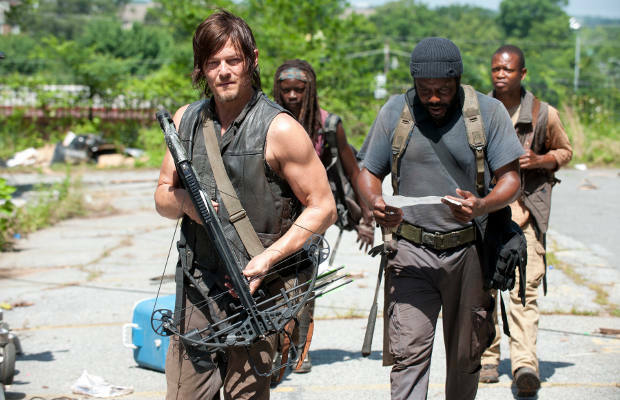 On the medicine front, Daryl&apos;s group&apos;s plot serves up the requisite action and flashy zombie kills that we crave. This is Michonne and Tyreese&apos;s time for the spotlight, as both characters are experts at hacking and slashing anything that even remotely looks undead. The action scenes at the auto supply store and the later free-for-all against a horde of walkers is the perfect counterbalance to the Rick/Carol plot, which is heavily focused on the moral dispute between the two. That being said, while Daryl’s group’s quest remains fairly suspense-based, the bizarre side plot involving Bob Stookey’s alcoholism is just so melodramatic that it makes the episode feel like a dated after-school special. We can practically here the hushed voice of Bob Sagat saying “This week, on a very special episode of The Walking Dead" when Daryl scolds Bob for carrying a bottle of whiskey in his bag instead of medical supplies. Bob went from being completely mute to nearly insufferable in the span of just four episodes, easily beating Carl&apos;s record. Let&apos;s just hope the zombies turn him into human sashimi before he reaches Lori levels of annoyance. Intercut with the journey of Daryl, Michonne, Tyreese, and Bob is the ongoing drama between Rick and Carol, who both travel together to find medicine for the group, as well as any sign of their friends. Last week, Rick found out that Carol had been behind the deaths of Karen and David in order to prevent them from further spreading the illness in the prison. The tension between the two is palpable at first, but for a while Rick attempts to play it cool and speak rationally to her. Their animosity comes to a head when they stumble across two more survivors in an abandoned house who want to tag along with them back to the prison. They are tentatively welcomed aboard by Rick and Carol, but Carol goes over Rick’s head and tells the two to search around the area alone for supplies and meet back up at the house in two hours. Rick instantly hates Carol’s plan, but the two are all-too-happy to oblige if it means sanctuary in the prison. Of course the two never make it back, and Rick is left to deal with yet another decision made by Carol that costs people their lives. With his anger boiling over, Rick finally snaps and banishes Carol from the group, believing her to be too unpredictable in the wake of the murders of Karen and David. The episode closes with Rick taking a lone car ride back to the prison, reflecting on the possibility that he just sentenced Carol to death out in the wild. This is a major development that will ultimately change the dynamic of the group and how they view Rick as a leader. That car ride brings me to my main pet peeve with the entire episode. I understand the show is sponsored by Hyundai and all, but the product placement throughout this episode is just nauseating. How is it that in a post-apocalyptic wasteland where every car is a rundown bucket of bolts, all of the Hyundai models look like they just rolled out of the show room? Even worse, if the zombie plague began in 2010, how is Rick driving a 2013 Hyundai Tuscon? If you’re going to sell your soul, at least throw some logic behind it. Does this blatant product placement ruin the episode? No. But it’s becoming so obvious that it pulls you out of the drama unfolding on the screen. Thankfully there are too many positives going on in the show that we’re not ready to revolt just yet. Hopefully next week The Walking Dead goes back to focusing on killing zombies and not trying to force-feed sparkling images of mid-sized sedans down our throats.